I love all the different versions of the render. I use them all the time!!! "still one of my all-time favorites"
This is still one of my all-time favorites after 13 years. Works like this one that stand the test of time are truly special. I would say this one is worthy of an update, but how can you improve something that's already perfect? "Snowy Creek from the 2006 gallery"
Walking the trails of galleries to find the best fit for the day, Spring Creek is my choice this morning. As I write this short piece, the early March Lion is upon us. Snow and more snow on the way in our morning forecast. This rendering reminds me when our area is blanketed with heavy snowfall the serene beauty of the mountainside and valley. "Snowy Creek" from the 2006 gallery (Ryan, Digital Blasphemy). This creationist artwork captures the majesty of our Mother painting the landscape. The thought had occurred me but as these are evergreen trees and I don't think the scene would look all that different in Autumn. Please make a autumn and summer please! This image has always amazed me! It looks like a photo I saw from years ago. Hard to believe this exists only in the digital realm. You are truly talented! To date, though your images have gotten so realistic, this is still the only one completely indistinguishable from a real photograph. Happy holidays and thank you for such amazing work Ryan! Thanks for sharing. That's uncanny! "An example of how you've gotten better over the years"
I'm no artist. I can hardly draw to save my life. But I can see when someone's been improving in the mastery of his craft. Granted, today's equipment is better, and it's not like you weren't good back then, but still...nine years ago, this image wouldn't have looked this realistic. I can only wonder what you'll be like another nine or 10 years from now. I did not see this one when you had it posted a while back... ..this is really awesome work..Great job on Vue on how you made the snow appear "wet" on the rocks at the bank of the river...and the soft feel of the winter atmosphere!! A very realistic render!!!! BTW, glad to hear you are out of the hospital and are getting better. The realism of this piece is amazing! I don't think I've ever seen any other of your pictures that look as real as this one; it's indistinguishable from a photograph. Fantastic! Again, this looks like a photograph! Love the details around the rocks. looks real. Excellent work. this is pretty close to why I left New England and never really went back to stay for any length of time. Makes me cold just looking at it. Oddly the colour version doesn't have the same effect. Not that it's not as good as this one, they are the same after all, as pictures, but the B & W one looks the way my mind remembers the Cape and trudging off to school, or back from school when it was barely light, and cold and WET ! It's more evocative I guess. The other version reminds me more of Norman Rockwell versions of the beautiful snow, soft "snick' sound of flakes falling gently , peaceful brook barely burbling.. Not a bad thing just two completely different versions of the same reality. its apity, when new artwork appears, people suddenly forget about images made few weeks ago. And of cource, no one looks at the old artwork. This work is really impressive. As some of old ones from 2000. Love it. Couldn't help a bit of day dreaming..
"Had a good run today, weather's been pretty good, just light snow. The hut is about half a k up the valley on the other side of the creek. We'll cross just a bit further down...."
To Bad About The Colored Light But It Still Looks Awsome !!! snowy creek is awesome! love the realism... can we get this in a dual screen? a way to make it more excellent!! This looks like a photograph. Amazing! 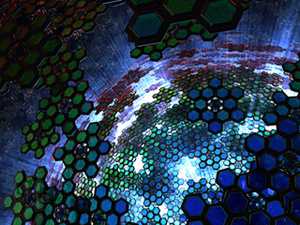 Can't wait to see what a spacescape or abstract looks like using this new software!! That's a nice view, where was this picture taken? Every time I look at this picture I manage to see something new, as sign that it is truely life like. One of your best pieces! It's like I'm in the picture. I love the land scapes. This one is breath taking. I can look at it for hours (like you would a fish bowl) and relax to it. Beautifully done. I just signed up for a year membership because of this picture. It is simply beautiful. I live in Michigan and this is exactly how fresh snow looks! The creek, the snow on the rocks, the trees--it is like looking at a photo. You are extreamly talented and I look forward to more of your work. I like this wallpaper a lot, and over all it looks great. The tree fade effect looks stunning and ultra-realistic. Unfortunately, the rocks more toward the foreground just don't look right. The river also looks a little strange but it's not that noticeable. The snow on the rocks especially looks fake, like blobs of flat white. I'd give this an 8 for capturing the essence of beauty of winter. Very nice. Again it seems that you didn't forget any detail. Even the branches of the trees look like they have some snow on them. Also beautiful how the more far trees "fade" away. What I also like is that your wallpapers match the time of the year: for every season there are some matching backgrounds. This one's my favorite at the moment! I just moved to southern California... NO SNOW HERE... but believe it or not, I LOVE the snow! My home state just got a lot of snow this last week and I'm sad I'm not there. Thanks for this image... it brings back memories! Wow, that looks like a photograph! I love the look of the snow on the rocks in the creek. very realistic. to respond to an earlier comment, yes the snow will be washed away by the water, but there are times right after the snowfall that you can see scenese like this. One thing I can't work out is the perspective. Are we looking up a slope to trees on a hillside or are we looking downhill into a valley? The river gives the impression that we are looking downstream? ... at an almost unbelievable level. Especially the snowy trees look like a genuine photo! It really does have a depth about it as stated by other members, the mountains behind really do blend to almost a non existence, then as you look around you notice them! I do have to say I agree with another member in regards to the water, there is something just not quite right about it. I live in Australia and thus I don't see snow (gotta love the tropics!) so I'm not sure, on the rocks in the foreground the snow is all the way down to the water, would this snow not get knocked off by the water? Hi Ryan, and all members. This is my first posting since I have renewed my membership (it expired a while ago). CG like this is why I keep coming back for more and always get great reviews of my wallpaper. I would like to see some of the differant variants other members were saying. I am alot more partial to night sceens my self. Amazing. The creek has a slightly digital look, but the trees might as well be real. I agree, this would be awesome for the next 4 seasons set. This one is really amazing. It look just like a picture of a snowy morning here in Bethel, NC. keep up the good work! I've been a member for a while, if you're looking for ideas im the pres. of a whitewater club here in the mountains, and I'd love to see a "raging river" sometime. Just a suggestion, thanks again for all you do. I can hardly believe it isn't a real photo! I am looking forward to a dual screen version of this. 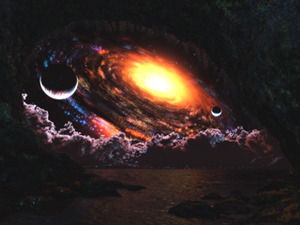 Another fine example of digital art. I vote to have this be the next "multi-season" piece. I think it woudl be nice to see spring/summer/fall versions of this same location! "One of your better ones..."
Besides what everyone else has said about this image, I really like the depth to it. I have this on my laptop, and with its LCD screen I didn't even realise there were mountains in the background until I looked really closely! One pickle jar suggestion I have is to make a crystal clear day version of this - with bright blue skies - similar to "First Snow" from 2000. I am amazed at the quality of this piece. It is almost impossible to tell it is a digital rendering. "This is actually quite awesome!" This is beautiful, and when I look at it I wish I was there. My brain doesn't want to acknowledge that it isn't really real. You are soooo good! Bluring the Line between CG and Photos. Absolutly amazing. Thank you. I concur with other posters. You've really captured a good "wintery feeling" scene. A Christmas Version with white or blue lights would look really good. Especially the reflection in the water. I would love to see this in night/other seasons/etc. versions. Awesome wallpaper! Heres a couple of things that could be done for a picklejar version or future work. 1. A night version with stars or that effect seen in Song Of The Sky, it would look really cool to see that reflecting in the stream. Possible christmas version? Perhaps one of the tres could be made to glow with lights? Keep up the awesome work Ryan! Ryan I am absolutly fascintated of this outstanding wallpaper. It really reminds me, of the winter sceneries, we had and have in southern part of Bavaria. It really looks perfect! I love the trees, but the creek is just not quite right. I can't explain it, but the rocks are just too stiff. But I love everything else. just absolutely amazing. I was waiting for your winter wallpaper to surface and man was it worth the wait. Best one I've ever seen. You just keep amazing me. This scene actually reminds me of a small creek that I used to play in a a child back home. None of my friends believe it's CG! Amazing work, keep it up! Thanks for bringing a little glimpse of winter to the UK, just had the hottest autumn on record, and winter looks like it will be the same, so I might not see any snow this year. Brilliant work, this and last years November snow really capture the essence of what winter is all about. Can't wait for the Dual screen for work! "Very nice ... idea for Christmas image?" Again, in my humble opinion ... this is very, VERY nice sir! IMHO, One of your best ever. As everone else has already said, this is damn realistic. Well done, man. Thanks for another great image. It's somewhat realistic. After taking a look at Morning Myst, I thought "wow, what could be better and more realistic than that?" Obviously, this one is. 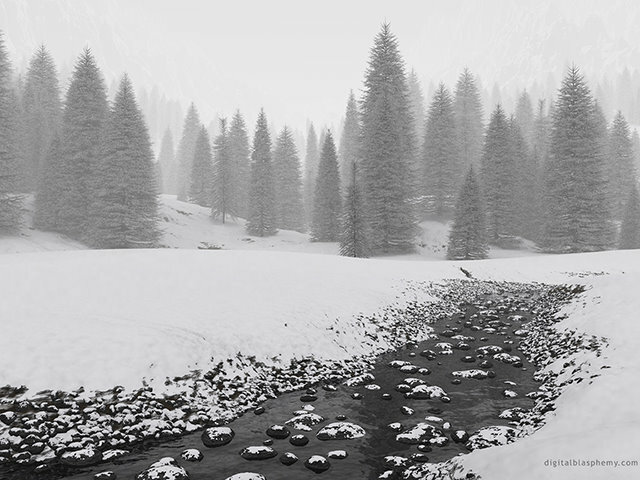 The trees are far enough to cover for the 3d rendering and the snow and water interaction looks absolutely credible. The foggy feeling adds just the right amount of mistery. Perfect! A real masterpiece. I can't wait for the dualscreen version to use it at work! That looks always like a photograph. Very well done! Ryan, I love it as it is. The best part is the realism of the trees. They look so soft and gorgeous! And to tell the truth, I love the lack of color. To me, a gray, overcast day in the mountains is one of the prettiest sights ever!!!!!! "Feeling a little Leefy lately???" Good work Ryan. Very nice design, BUT... lacks a touch of colour. Lacks that other-worldly feel! Really nice, something about this looks very realistic. I think an alternate version with more color would be cool though. Absolutely stunning work, Ryan! This image is definitely one of the best I think you've ever done! Wonderful! This is absolutely amazing. Superb work! You've certainly outdone yourself this time! I really believe that you could show this scene to someone and easily pass it off as a photograph. Even close up it looks perfectly real. It's incredible, everything is right, from the stream, the snow covered rocks, the fine snow falling and the trees in the background. This is perfect as it is; not only a render but a work of art. I really can't make any criticisms! I only gave it 9 instead of 10 because the monochromicity is not to my taste: here in Ottawa, we see enough of this all winter that I need more color to keep my mood up. How about a less-monochrome pickle jar version? "Great timing . . ."
After Friday's 16 inch snow here in mid-Missouri, more snow! Sorry to start off the commenting with a complete lack of eloquence, but WOW!!! This is an amazing piece! The creek looks wonderful, and the snow has no unnatural gloss to it that most CG textures tend to have. The best part of the picture, though, has to be the trees. I looked at this pic from the bottom up, and when I saw the trees, my jaw dropped. Seriously; I thought these trees had been imported from a photo. Did these trees come from Vue d'Esprit?